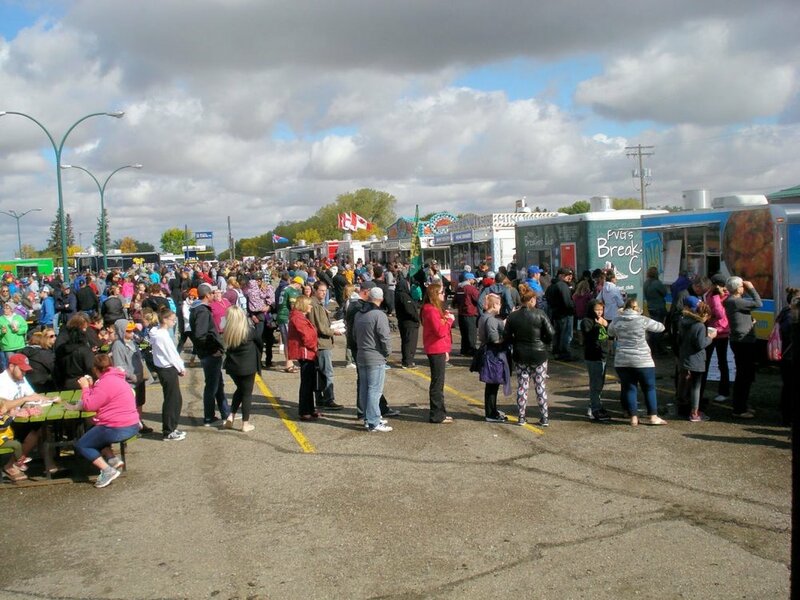 This past weekend, roughly 19,000 people partook in the first (hopefully annual) Food Truck Warz in Brandon. The event took place in the Victoria Inn parking lot, and there were 15 vendors set up as well as live entertainment provided by several local DJs. The weather wasn’t great, to start with. Saturday was cold and rainy. Still, people (myself included) persevered. With my food truck-loving boyfriend (hereafter referred to as NerdBoy) in tow, I made my way to the event grounds. We had to park across the street, but that wasn’t a big deal. The West-End Sobey’s has a large lot, and crossing the street without crosswalks or any real safe, designated crossing spot was a bit harrowing, but we made it. Next, we needed to take advantage of the ATM in the parking lot, because not all vendors accepted cards. Fine, whatever. We beat the line. Then it was on to the main event: food. NerdBoy and I did a cursory tour of the trucks. Picking one in particular to eat at is no small feat when you’re on a time crunch. He decided he wanted to eat at Mikey D’s BBQ, a food truck representing a restaurant based in Manitou, MB. They featured a number of BBQ options, including the classic burgers and pulled pork. I wished him luck, asked him to get me a burger, and went to stand in the line for Tot Wheels, a Winnipeg based gourmet tater tot truck. We were both in our respective lines for about an hour despite the cold drizzle that was starting to come down. We got our food and retreated back to the car to eat. Because we missed out on several other trucks that had appealed to us, NerdBoy and I ventured forth once again on Sunday morning. We made sure to get there shortly after the event began, as he had to work at 1:00PM. The biggest thing on his list was churros, because who doesn’t love deep-fried, cream filled treats? We needed real food, however, so stopped by Pork Floyd* for pork sandwiches, and then got in the forty-five minute line for churros. It was worth it. We got a variety pack and shared. We agreed that our favourite flavour was the Bavarian cream, followed by the classic, unfilled churro. He liked the Nutella filling, I skipped it entirely because I’m a heathen and dislike Nutella. The dulce de leche and raspberry fillings were also good, but less good than Bavarian cream, in my unprofessional opinion. To make a long story short, the food was delicious and overpriced, the venue was crowded with people, children, and dogs, and I am so very looking forward to next year’s event.